"The staff is friendly and caring! I highly recommend this place to anyone." "Dr. Hernandez is very professional and friendly. Along with the rest of the staff!" "Dr. Hernandez was very patient and took the time to answer all my questions." "I would recommend this office to everyone I know." "Made an appointment last minute and they fit me in. Wonderful doctor and staff!" "Reputable practice! Couldn’t be happier with the Doctor! He was kind and efficient!" 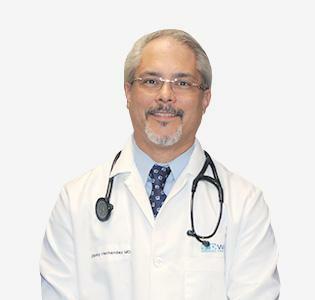 At DWH Medical Center, board-certified family medicine specialist and medical examiner Danny Hernandez, MD, CIME, offers comprehensive medical care to patients from in and around Allentown and Quakertown, Pennsylvania. After attending Stockton State College in New Jersey for his Bachelor of Arts and Harvard University for his science concentration, Dr. Hernandez went on to earn his medical degree from Rutgers’ Robert Wood Johnson Medical School. He then completed his residency in family medicine at the Medical College of Pennsylvania. Dr. Hernandez provides a comprehensive range of services to help patients improve their health, well-being, and appearance, including pain management services, Pap smears, Botox® injections, weight-loss advice, and more. He also helps patients on their journey toward sobriety with Suboxone® management services and providers offers workers’ compensation exam. Dr. Hernandez put his patients first and offers attentive, customized care designed to help his patients enhance their overall wellness and reduce their risk of illness and chronic disease. His goal is to educate his patients and empower them to make informed decisions about their health care. We accept all of the insurances listed here. Please call to inquire further regarding yours. "The staff is great and knowledgeable. They really go the extra mile for their patients!" "Dr. Hernandez made me feel very comfortable and you can tell he really cares about what you are going through. I was able to be completely open and honest with him." "Great Doctor. Took time to listen to all my medical problems and correctly diagnosed me. Refreshing to find a doctor who truly cares. Highly recommend Dr. Hernandez."